Skagit River fishing is a true Northwest experience. The Skagit River is a river in southwestern British Columbia in Canada and northwestern Washington in the United States, approximately 150 mi long. The river and its tributaries drain an area of 1.7 million acres of the Cascade Range along the northern end of Puget Sound and flows into the Puget Sound. The Skagit River is a big river, but the longest river in the United States is the Missouri River. There are a total of 9 rivers in the United States that are over 1,000 miles long! One of these rivers is the Snake River, at just over 1,040 miles long. The Skagit River rises at Allison Pass in the Canadian Cascades of British Columbia. From there it flows northwest along the Crowsnest Highway, which follows the river into Manning Provincial Park. It turns abruptly south where it receives Snass Creek from the right, then enters Skagit Valley Provincial Park at the point where it receives the Sumallo River from the right. It receives the Klesilkwa River from the right, and turns southeast to flow into Ross Lake, where it crosses the Canada-United States border and into Washington state. Ross Lake is formed by Ross Dam and is approximately 24 miles long, winding south through Ross Lake National Recreation Area. Here the river receives Beaver Creek from the right and Ruby Creek from the left. Spilling out of the dam the river enters Diablo Lake, formed by Diablo Dam, and receives Thunder and Colonial creeks from the left, before it enters the third and final reservoir, Gorge Lake, formed by Gorge Dam. All three dams are part of the Skagit River Hydroelectric Project. Past Gorge Dam, the river is often dry, as its waters have been diverted to generate hydroelectricity. Water is returned to the river as it passes Newhalem, a company town for Seattle City Light. Copper and Bacon creeks, both flowing from North Cascades National Park, merge into the Skagit from the right as it meanders slowly through an agricultural valley, past Marblemount, where the Cascade River joins from the left, and Rockport, where it receives its major tributary, the Sauk River, from the left. After receiving the Sauk River, the Skagit turns west, flowing past Concrete and receiving the Baker River, its second-largest tributary, from the right. The river continues to flow west, past Sedro-Woolley and Mount Vernon. Down river from Mount Vernon it splits into two forks, a north and south fork, which forms Fir Island. These two forks both empty into Skagit Bay of Puget Sound. 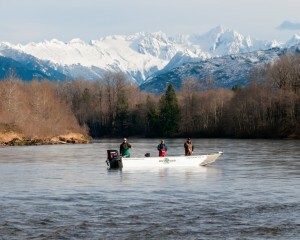 Skagit River fishing can be done by walk in, drift boat and river sleds. White Sturgeon are not native to the Skagit River. However, sturgeon can be caught on the lower river near Mount Vernon out to Skagit Bay in the Puget Sound. The Skagit River has been a destination for fly anglers from around the world. The Skagit River is where the “Skagit Style” of speycasting was actually developed from traditional speycasting principles by steelheaders in the Skagit River area during the early 1990’s. The term “Skagit Casting” was coined in order to distinguish this offshoot system of speycasting from other types of speycasting. Skagit casting does possess its own casting fundamentals and traits of distinction. The Skagit River supports one of the largest wintering Bald Eagle populations in the continental United States. The eagles feed on Chum, Coho and Pink salmon that have returned to spawn. The eagles arrive in late October or early November and stay into February. The highest number of eagles is usually seen in January. These eagles come from inland Canada and as far away as Alaska and Montana. When the salmon run is plentiful, as many as 600 to 800 eagles are attracted to the river. The river takes its name from the Skagit tribe, a name used by Europeans and Americans for two distinct Native American peoples, the Upper Skagit and Lower Skagit. Both tribes traditionally spoke dialects of the Lushootseed language, a branch of the Salishan family. The Upper Skagit tribe occupied the land along the Skagit from what is now Newhalem to the mouth of the river at Puget Sound. The Lower Skagit tribe lived on northern Whidbey Island and have come to be known also as the Whidbey Island Skagit. In May 2013, a portion of the I-5 Skagit River Bridge collapsed, sending two cars into the water near Mount Vernon, Washington. Traffic in both directions had to be rerouted around the bridge. A temporary span was installed June 19, 2013, and the heavily traveled bridge re-opened to traffic. Free-flowing characteristics and water quality of each of the four rivers. Outstandingly remarkable wildlife, fish, and scenic qualities. The Skagit Wild and Scenic River System flows through both public and private lands. Fifty percent of the system is in private ownership, 44 percent is National Forest System land, and 6 percent is owned by the state and other agencies. The Skagit Wild and Scenic River is managed by the U.S. Forest Service as part of the Mt. Baker Snoqualmie National Forest. The Skagit River Hydroelectric Project is a group of three major dams, constructed in the 1920s and 1930s, which are a primary source of hydroelectric power for Seattle and other area communities. The Skagit Valley Railroad was constructed by the city of Seattle to transport workers on the dams. The river today is a popular destination for whitewater rafting and fishing; both conventional fishing and fly fishing. Canadian tributaries of the Skagit River include the Skaist, Sumallo and Klesilkwa Rivers. United States tributaries include the Cascade, Sauk and Baker Rivers.